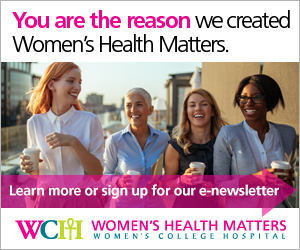 A trusted source of information, news and research findings on women's health from Women's College Hospital. Women’s College Hospital dermatologist Dr. Christian Murray discusses the best strategies for sun safety and debunks some common myths about sun exposure and damage. Learn to recognize the signs of a substance use disorder and how predisposing factors affect us when it comes to addiction. A well-balanced diet is an important part of maintaining your overall health, but it is a vital part of maintaining your heart health, according to Women’s College Hospital’s (WCH) cardiovascular dietitians. Find out what to look for to spot non-melanoma skin cancer, the most common cancer around the world. Do sensational media reports reflect the realities of sexual assault? When should I have a mole checked out? Losing more than five per cent of body weight may slow down the degeneration of knee cartilage in people who are overweight or obese. Cartilage degeneration is a key indicator of osteoarthritis. A new Canadian study found that using certain antibiotics during pregnancy was linked to a higher risk of miscarriage. Classes of drugs associated with higher risk included quinolones, tetracyclines, sulfonamides, and macrolides (except erythromycin). There was no increased risk linked to the penicillin and cephalosporin drug classes. For women with breast cancer, pregnancy does not increase the risk of dying, new Women's College Research Institute study shows.